Decked in pristine white with accents of wine, the Livia showflat exudes quiet elegance and sophistication. 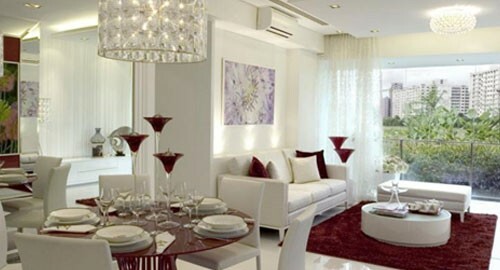 Though using predominantly white, the designers worked with different textures to create layers of interest and depth. The crystal lightings add glitz and glamour while the sheer day curtains in delicate lace prints bring in a romantic element that complements the surrounding greenery. The living room setting is a three-seater sofa and a long bench that maximises the view of the balcony. The dining area centres around a round dining table in wine with an intricate pedestal design that is light and gives an illusion of a floating dining table top. Crockery in white china and gold trimmings complete a refined dining experience.